During 2017, Moreton School (part of the Amethyst Trust) where I work, changed the curriculum to support the needs of our pupils by adding year 9 to KS4, thus allowing pupils to start their GCSE earlier. This gave Moreton Art Department the opportunity to explore new qualifications. Students could have commenced GCSE course work earlier, but I did not feel this was the correct direction for our students. A more diverse qualification was needed, that could be run over a single year. I was delighted to find Arts Award Silver, that fitted my brief. The qualification allows pupils to understand and interact with art differently, prompting them to visit Art Galleries and work with outside practitioners, as well as pushing art as a career choice. Over the 2017-18 academic year, pupils were able to build up their skills within art ready to tackle GCSE. The pupils found the Silver course individualised and engaging, they loved the idea of setting themselves a challenge and developing their skills. This encouraged students to have focus and be driven to improve. The course allows for a lot of reflection and encourages self-motivation. The class that I ran the course with was very diverse, from SEND pupils to higher attainers. The Arts Award Silver allowed time to support and challenge pupils regardless of their ability and additional needs. 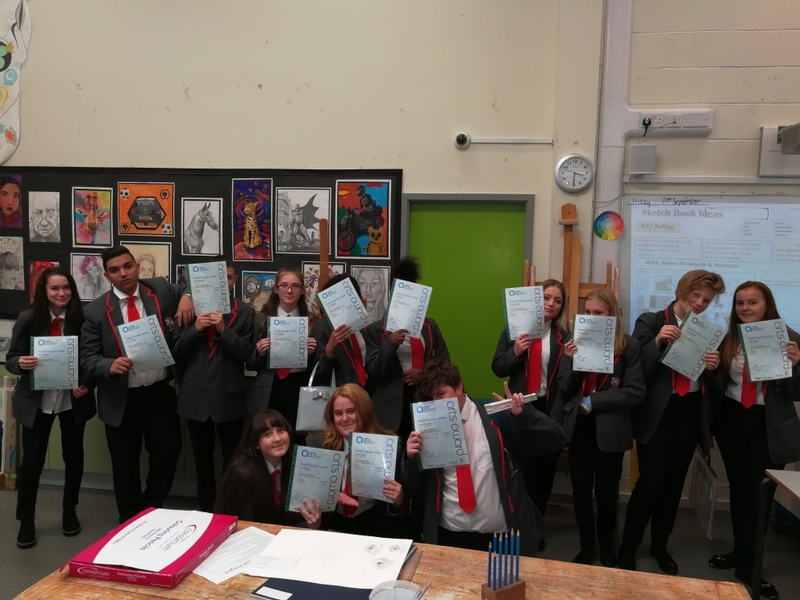 All pupils within the class passed the course and obtained their Arts Award Silver certificate qualification, which they were all delighted by. Throughout the year the pupils and myself experienced many highs including visiting The New Art Gallery Walsall, where we reviewed the exhibitions and researched the artist Jacob Epstein in their fabulous Garman Ryan Epstein Collection. The year 9 pupils really enjoyed the experience, the majority of the class had never visited a gallery before and students were amazed by the artwork. It prompted pupils to think about art as a career path. The pupils were able to take the experience of the Art Gallery and allow it to influence and flourish within their work. In response they created clay busts inspired by the collection. The pupils were also able to work with the Liverpool based artist Anne Brierley, looking at large scale portraits in mixed media. The workshop was inspirational to the pupils, allowing them to push themselves and work at a large scale confidently. All pupils loved the day and they felt it was really beneficial to see an artist in action. The unit most enjoyed by the pupils was Unit 2: Arts Leadership, which allows the pupils to organise and create their own art event. Moreton pupils decided to host an art exhibition, showcasing the art they had created throughout the year. Pupils took their job roles very seriously and produced a well-managed and organised exhibition. Pupils provided refreshments and completed all of the labelling, mounting and curation for the exhibition, advertising through posters and social media and a brochure for visitors to take away. Pupils also hosted the event. It was a very proud day for all of the parents that attended as well as teachers and friends. Overall, the course ran smoothly. Initially I was a little concerned about moderation due to it being the first time teaching the course but Arts Award online advisors were very helpful. Advisors will also visit schools, if it is the first time teaching the qualification and the candidate requirement is fulfilled. I found this option very informative and it reassured me that I was on the correct track in regards to fulfilling the criteria. It also alleviated any concerns about how I would internally moderate the work. Arts Award Silver is a qualification I intend to run for year 9 every year, the qualification allows the pupils to have a breadth of knowledge and consider art as a potential career choice in the future. Arts Award Silver was such a hit at Moreton school it is now being implemented across the Trust, becoming part of the curriculum at Alderlsey High school this year. Arts Award Gold is also offered as an enrichment for our Amethyst 6th form.